These days, down-sizing is all the rage. Whether you’re talking carbon footprint, food portions or consumption in general, less is more. In one particular case, I disagree completely and that’s of course in fishing. We humans might be worried about getting fat or over consumption of our resources, but the fish definitely aren’t. In fact, the most sought-after gamefish in the country is named for the size of his mouth, not his brain. And its name starts with Large - you can guess the rest. In a fish’s world, less is definitely not more when it comes to food. Less is more when it comes to expending energy to catch food, but the food itself is all the more valuable when it contains more calories. Maybe if humans had to expend any real energy to obtain our food, we’d be better off. Instead, we purposely burn energy just so we can eat more without gaining weight, a very unnatural situation. At the time of year when our waters are nearing as warm as they’ll get in the season, this concept is even more important to anglers. Since fish are cold blooded, the warm water has them giddy with energy, meaning that they’re metabolizing calories at a higher rate than in colder months. Couple that with their instinctive desire to pack on pounds during their all too short growing season and even more fundamentally, to out-compete their peers in a very Darwinian struggle and it means that big meals are better. Big meals that are easy to catch are better still. What does this all mean to the angler? Bigger baits of course, with bigger being relative to the species pursued. To a bluegill, a four-inch nightcrawler might be a huge bite, while to a largemouth bass (the most popular of all gamefish nationwide, as noted above) it might not even be worth swimming over to investigate. How about trout? After all, I live and guide in Colorado where trout reign supreme and everyone knows they eat tiny bugs. Do you know why they eat tiny bugs? Because that’s most commonly what’s available to them! Why do they have camouflage, superior jaws lined with sharp teeth and supreme speed if all they evolved to do is catch tiny bugs drifting helplessly in the current? Trout, at least during warmish water periods, will forget they ever saw a bug when a 4” sculpin, young of the year whitefish or a crawdad shows itself. This is especially true with mature brown trout. Next time you trout fish, try huge streamers, bulky tube jigs or better yet, an erratic minnow plug about five or six inches long. I think you’ll be surprised. 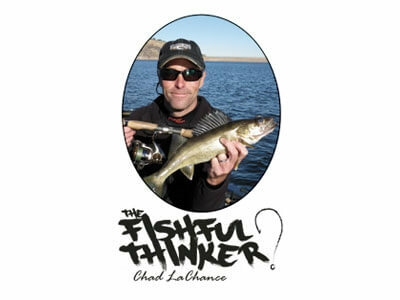 Walleyes are in the top five fish in popularity for anglers. They eat fish of course, but what kind of fish do they eat? In many western reservoirs where they are stocked, rainbow trout are the meal of choice for walleyes. Those freshly stocked “catchable” trout are 7-10” long, lack spiny fins and are very naive to the ways of the world, a perfect food choice for big walleyes. I know of folks catching great walleyes on 7-10” long trout-imitating “swimbaits” in true match-the-hatch style. Feed ‘em what they’re eating. Those fat, lazy largemouth bass slobbin’ around in our local ponds, reservoirs and gravel pits are the best example of gluttons. Their preference, according to the scientists at Berkley’s labs (how do I get their job??? ), is to eat approximately 1/3 of their body length per sitting. So that nice five pounder you want to catch that is about 20-inches long is sitting on a drop-off or dead fall somewhere, waiting for something nearing 7” long to swim by. Sure, he’ll eat smaller things, but he’ll be more motivated to chase down a bigger bite, which of course he’ll vacuum into that cavernous maw in one swift engulfing motion. On your next bass pond outing, try a 10” plastic worm and see how that goes for you or perhaps a big noisy topwater bait or even some sort of rodent imitation. Swimming mice and rats are prime candidates for largemouth cuisine. A couple of key points about fishing larger lures deserve mentioning. First, use appropriate tackle to present them. Using too light of tackle is a common problem with big lures and it will hamper your ability to both present the lure well and handle the fish you catch with it. Heavier line will help you control the larger baits better, too. This same concept goes for your fly tackle; heavier rods and subsequent lines and don’t be afraid of big tippets. I find I do a lot better on streamers that are heavy for their size; closer to the bottom is almost always better. Also, bigger lures are much easier for fish to peg as fake, so pay attention to all the details, including casting angles and retrieve speed/cadence. It is always my goal to surprise the fish when my large offering enters their peripheral vision as opposed to them knowing it’s coming from way out there. The latter gives them too much time to decide. As you consider your fly, lure or bait selection over the next couple of months, consider upsizing and make it easy to catch too. You might find that nobody told the fish downsizing was in.